Increasing in numbers, year on year, pest bird species such as Feral Pigeons and Seagulls are becoming more of a problem, with their droppings and nesting material fouling buildings and walkways and blocking guttering and downpipes. With the presence of these pest birds and their droppings, there is an evermore potential risk of harmful bacteria and disease organisms being passed onto humans. Pest birds can also be responsible for insect pests infesting buildings that they habituate and these include; Flies, Fleas and Mites. Overall, it is nowadays considered very unacceptable for pest birds and people to co-exist in the same places and we therefore offer a range of bird proofing and control services to meet this criteria. As well as Feral Pigeons and Gulls, we also tackle problems with; Starlings, House Sparrows, Wood Pigeons, Jackdaws, Rooks and House Martins. For further information on our services and to arrange a free of charge survey to assess your pest bird problem, please telephone or e-mail your details. In situations like this, we offer a comprehensive service that involves treating the droppings with biocide solutions to kill off the bacteria, then clearance and safe disposal of the droppings. Thereafter, we carry out a sanitise clean and insecticidal treatment of the affected areas to ensure it is returned to a safe condition. The most effective means of preventing all types of pest birds from settling on buildings or areas. Comes in 4 mesh sizes for use against Gulls, Pigeons and smaller birds such as Starlings and Sparrows. 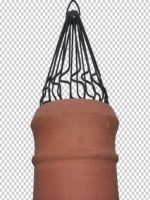 Nets are usually affixed to and held in place by steel fixings and perimeter straining cables. Properly fitted netting systems will last for many years. A versatile system that comes in several widths and pattern configurations and can be used to prevent Pigeons from perching and roosting on many surface types such as; ledges, pipe work, girders etc. A larger version is also available to prevent Gulls from settling on roof ridges, parapets, lampposts etc. One of the long established proofing systems and used to deter Pigeons and Gulls from perching and roosting on various ledges and surfaces. Comes in variety of bases that can be glued or screwed down or clamped onto pipes or girders etc. Due to their high vantage points, chimney pots and stacks are a favourite perch for birds. From time to time, however they will drop inside the chimney where they become trapped. Likewise, chimneys are often used by Gulls for nesting, either on top of the stack or in the valley behind. We can supply and fit a wide range of proofing devices to counter both of these problems. If necessary, we can undertake control measures to reduce or eradicate pest birds and this includes trapping or shooting.